In this sequel to MONUMENT 14, the group of survivors, originally trapped together in a superstore by a series of escalating disasters, has split in two. Most of the kids are making a desperate run on their recently repaired school bus for the Denver airport where they hope to reunite with their parents, be evacuated to safety, and save their dying friend. But the world outside is dark and filled with dangerous chemicals that turn people into bloodthirsty monsters, and not all the kids were willing to get on the bus. Left behind in a sanctuary that has already been disturbed once, the remaining kids try to rebuild the community they lost. But when the issues are life and death, love and hate, who can you really trust? Blurb: AWESOME, but WAY too short. Review: I want to avoid spoilers, so like most of my sequel-reviews, I'll keep this short. I loved the first book in this series, and I loved the second book just as much. I found the characters just as engaging, and I loved getting to see more of the world. There were some moments that I was literally sitting ramrod straight because I was so excited about what was happening. That's pretty much all I have to say in terms of a review. However, I do have one complaint: It was way too short. Not even an "I wish there was more" kind of short. It was a full-on "this isn't long enough." It read more like Monument 14 #1.5. A pre-sequel novella, or something. Maybe I've just become spoiled by big books lately, but anything under 300 (MAYBE 275) pages seems tiny. The first book was pushing it for me at 294 pages, but this one was just plum too short. So, if you want my advice, I would read these back-to-back as if they were one book. Sky on Fire takes up immediately where the first book left off, so I don't even think it would feel weird. And if this were 1 500-600 page book I think it would be perfect. After all, when I love characters and a story this much, I want as much as I can! Hopefully book 3 (Savage Drift) will be bigger! But I'll definitely read it regardless of how long it is, 'cause this series is awesome! 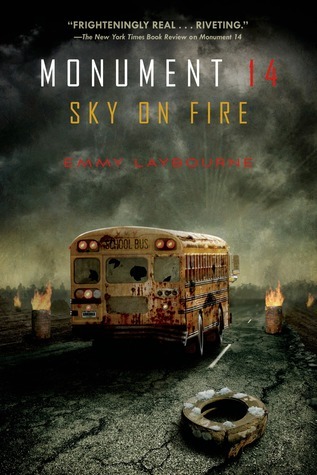 0 Response to "Monument 14: Sky on Fire-- Emmy Laybourne"